Yesterday, the country legalized marijuana outright. Soon, anyone over the age of 19 will be able to legally buy and consume marijuana in most parts of Canada. That includes tourists. Of course, regular readers saw this coming from a mile away. That’s because I’ve been covering Canada’s marijuana market for almost a year now. But if you’re new to the Dispatch, don’t worry. I’ll bring you up to speed. In April 2017, Canada started the process of legalizing marijuana outright when it introduced the Cannabis Act. In November 2017, that Act passed the House of Commons. The last hurdle this Act needed to clear was Canada’s Senate. And that’s exactly what happened yesterday. This is great news for the people of Canada. It means they’ll have more say about what goes into their bodies. It’s also a huge opportunity for investors. In a minute, I’ll show you how to turn this historic decision into huge profits. But first, let me say something. Every week, it allows me to isolate a radically different yet powerful trade… which has proven to return as much as 3 years’ worth of profits in as few as 3 hours. Again: That’s week after week, month after month, for a decade and a half. This year is no different. In fact, this week is no different. Which is why those same Wall Street pros offered me 7-figure sums, routinely. I told them all “NO.” But today, I’m pulling back the curtain for you. Click here now or risk missing out. Uruguay legalized marijuana outright in 2013. Last year, it rolled out marijuana legalization nationwide. It’s now legal to grow, sell, and consume marijuana there. But trust me… Uruguay isn’t the “marijuana Mecca” that a lot of people think. I know because I was just in Uruguay. I went there to visit Doug Casey and get a firsthand look at the country’s marijuana industry. And I didn’t find any coffee shops there, like you’d see in Amsterdam. There aren’t even dispensaries like in Colorado, California, or Oregon. Now, that might not seem so bad. But you need to realize something. Less than two dozen pharmacies signed up to sell marijuana. And almost all of them are in the city of Montevideo. But it’s not just inconvenient to buy cannabis in Uruguay. The quality of the product is also poor. You see, pharmacies in Uruguay can only sell cannabis with low levels of THC—the compound in marijuana that gets people high. It’s so bad that many locals have opted to grow their own marijuana. And I got to see one of these operations when I was in Uruguay. Here’s a marijuana plant being grown outside the Montevideo Cannabis Museum. Here’s another photograph I took. These plants are being grown indoors at the same museum. What you’re looking at is a very basic setup. 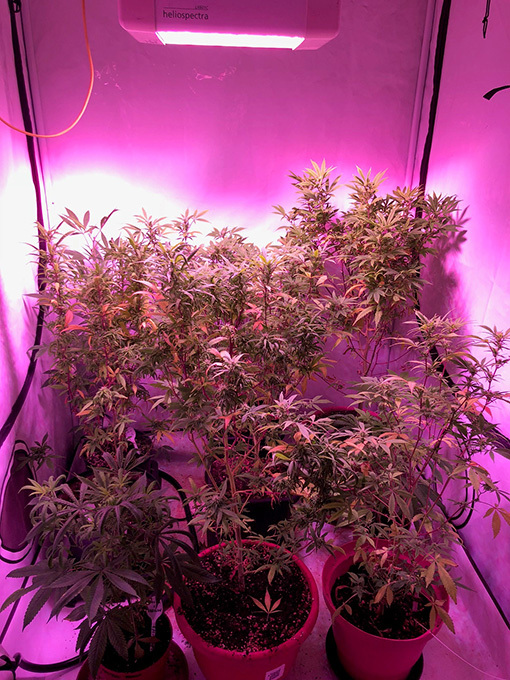 A grow operation like this might produce mediocre marijuana at best. Will this go down in history as THE moment that changed America – forever? At first, I didn’t think so. And you won’t either, I bet. But your mind will change in 60 seconds… once you see the stunning proof this millionaire and former hedge fund manager is releasing today. I know because I’ve visited world-class marijuana cultivation facilities in Denver, Colorado. And frankly, that operation isn’t even in the same league. 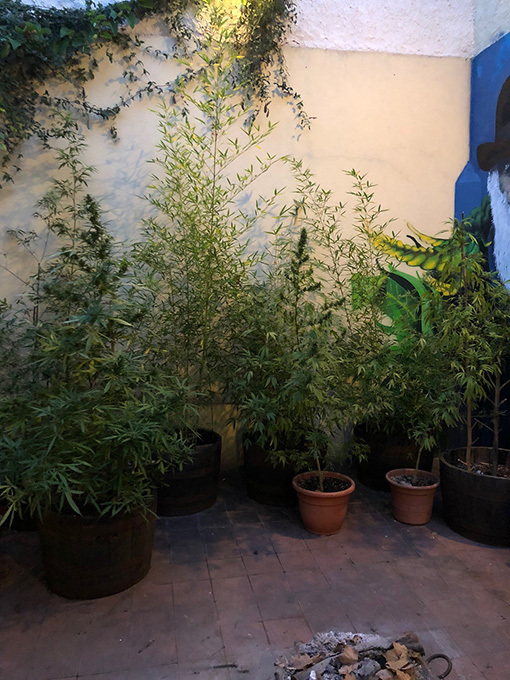 And yet, a lot of people in Uruguay get their marijuana from grows like this. In other words, Uruguay may have legalized marijuana. But its marijuana economy is anything but flourishing. You see, Canada’s government didn’t just legalize marijuana… It put its cannabis industry in a position to thrive. In fact, accounting firm Deloitte recently projected that Canada’s marijuana market could become a $4–$9 billion market once recreational use is legalized. Keep in mind, Canada’s marijuana market is currently estimated to be worth around $400 million. That means Canada’s legal marijuana economy is set to grow at least tenfold in size… almost overnight. But that’s certainly not the only reason to be bullish on Canada’s marijuana industry. You see, Canada’s big marijuana companies don’t have their sights set on Canada. They’re interested in going global. In fact, they’re already exporting marijuana, expertise, and technology all around the world. That puts them light years ahead of Uruguay, and frankly every other country on the planet. And that competitive advantage only got stronger after yesterday’s historic decision. Today, it’s up another 3.8%. But don’t worry if you don’t own Canadian marijuana stocks yet. This rally has a long way to go. To understand why, look at this chart. 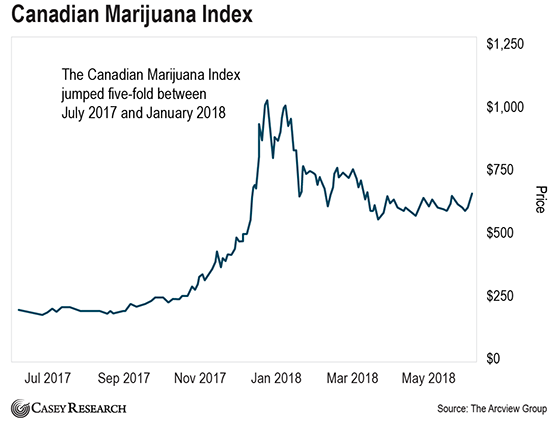 It shows how the Canadian Marijuana Index has done over the past year. You can see Canadian marijuana stocks jumped more than five-fold between last July and January. Then, the market pulled back in a big way. But that’s healthy after a huge run like that. Since then, the market’s been mostly trading sideways. And that’s a good thing. You see, the Canadian Marijuana Index is still 35% below its January high. In other words, Canadian marijuana stocks are on sale right now. So, consider speculating on Canadian marijuana stocks if you haven’t yet. Just remember that the global marijuana industry is still in its early days. So, treat them like a speculation. Don’t bet more money than you can afford to lose. Keep your position sizes small. And take profits as they come. P.S. Crisis Investing editor Nick Giambruno has been following this trend right alongside me. And he’s unearthed six cream-of-the-crop marijuana stocks to take advantage of this explosive trend. Even better, they’re all buyable today—right ahead of what ought to be a huge cannabis bull. You can get access to these names, as well as all the future research we have planned for the legal marijuana market, by signing up for Crisis Investing. Learn more here. Are you taking advantage of the momentum in pot stocks now? Let us know your thoughts on this idea—and any questions or suggestions you have for the Dispatch—right here.